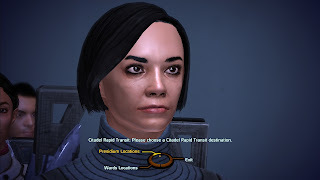 I'm not going to do a review-style blog entry on this one since the series of Mass Effect games is so popular that information and images regarding each can be found virtually everywhere on the internet. In other words, if you haven't heard something about these games it's likely you've actually been living in another galaxy. This morning I started playing the first Mass Effect game because Mass Effect 3 (as you may have heard) is out now and I decided that it was probably as good a time as any to actually start playing the game(s). Since they've received almost nothing but good press and have been praised with gaming awards, I went into the first game with rather high hopes regarding how enjoyable it would be to play. My friends gushed about mass effect and its story. Frankly (only having played 1) I'm more amused by the awkward five or so seconds it takes for Shepherd and Kaiden to speak or Shepherd walking up to groups of people talking that just stand and stare back at him. It feels more like Asperger's Effect. Not like the direction my blog is heading in is any less! You know, I was actually waiting for the third game to start playing them too. I've put that on hold due to the scale of the colossal shitstorm raging about the ending though. I was avoiding them too. All I wanted to know was, "are the endings good and do they change a lot depending on your path?"